Oh, spring. So many flowers to smell, so many butts to sniff. When it starts to be pretty out, you might find yourself falling in love all over again...with your pup. If you'd like to empty your pockets in order to express your devotion, here are some products that will please both dogs and their devoted humans. Picture it: the birds are chirping, the sun is shining, your spaniel's ears are blowing in the breeze, and, in your hand, a warm and odiferous bag of poo. Is this scenario in your future? Not if you have a PoopPac ($30). These zippered paw-shaped bags are meant for transporting excrement from the sidewalk (or beach or trail) to a garbage. 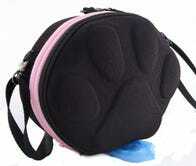 You can either clip it to your waist or wear a strap so it hangs like a pocketbook. There are two zippered compartments: One that holds a roll of bags and can also accommodate a wallet and keys, and then another for the business. 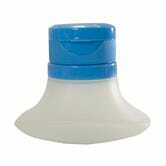 This section, which is made of easy-to-wipe-clean molded plastic, contains a little charcoal filter to absorb bad smells. If you can get past the fact that it's basically a purse made to hold excrement, it can actually be useful. The Doggie Did ($11) is a similar device, which is a little less clunky. It attaches the filled waste bag to the leash, so that you have your hands free to pick flowers. Or pick up more poop. In good weather, people spend more time with their dogs in public. And that means it's fine if we humans, experiencing the dopamine rush of being outside without a coat, rush up to greet every single cute little furry thing. Not! Many dogs are not okay saying hello to new people or new dogs. The best way to avoid bad reactions from sensitive dogs is to always communicate with owners before socializing. The Yellow Dog Project is an international effort to try to get people with reactive dogs to tie a yellow ribbon around their leash as a signal to others to keep some distance, but until this shorthand is more widely understood— or until every single person in the world learns to ask "Is your dog friendly?" — there are some tools that can help keep everyone safe. Another way to keep dogs (and humans) safe outside? A muzzle. I think it's a good idea for every dog to learn to wear a muzzle, whether or not they have a history of chomping flesh. Fact is, anything with a jaw can bite, and even a normally harmless dog can do damage if he is super stressed or scared. Problem is, muzzles look so severe, right? Most humans don't enjoy rain. But this season is extra cold and wet if you're a foot off the wet ground, covered in soaked fur, and can't carry an umbrella because you don't have hands. There are lots of dog rain coats out there, but most of them either restrict a dog's head movement, or they just don't cover the head at all. This is why the Push Pushi raincoat ($30), with its awning-style hood, is a complete revelation. Sure the weather might be good, but that doesn't mean that you necessarily feel like spending hours lobbing slobber-covered tennis balls in the dog run. Fortunately, you can now outsource this activity to the robots. In fact, you can even do it inside. The iFetch ($99) is a ball launcher that will have your dog throwing his own darn balls. 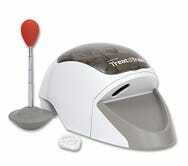 Treat & Train remote treat dispenser ($101). Of course, you might have to train your dog to put their ball into the machine, but this can be easily done. Here is one of my students, Stella, practicing for the arrival of her iFetch, with the aid of the Treat & Train remote treat dispenser ($101). Here's a shameless plug! The Lickety Stik stinks. Really badly. In fact, most things we feed to dogs smell pretty bad. Thank goodness for Fideau ($25), a fragrance designed to mask the stinky smell of dog products with notes of maple and smoke. 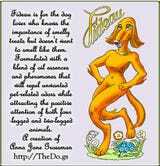 I helped design this pefume, which also includes pheromones designed to entice both dogs and men. I know you're thinking "Oy, another dog trainer with her own custom fragrance." But humor me. I carry a bottle of Fideau and a Lickety Stik with me, which is why I have men following me on all fours down the street and dogs buying me flowers. Happy spring! Now let's all go pee on trees. 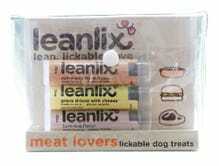 Have another good spring gadget idea for dogs? Post the name of the product, photo and description with a link to Amazon in the comments. Anna Jane Grossman is a dog-obsessed writer, animal behavior expert, and professional animal trainer in her native New York City. She runs School For The Dogs and has written about pets for The New York Times, Gizmodo, Vice, ReadyMade and Animal Planet. She also runs dogs.kinja.com. Editor's Note: Anna Jane recently lost her School for the Dogs and her own home in a dramatic fire on December 29, 2013, just before the New Year. She's now trying to rebuild it through an Indiegogo campaign, in case you want to help.